We are only just over two weeks into the new year and I already feel like I am a bit late with this post. It is a constant battle to stay on top of everything, and while I love writing here, I’ve found I’ve had to succumb to prioritisation, and the tasks that help to bring in the cash are what need to come first. The past few months, I’ve even toyed with the idea of closing this blog, but every time I think of it, it makes me feel sad. This is where my creative journey began, I feel like it is almost a part of me. My life, interests and style have evolved over the past 10 years since I started blogging, but that’s ok, and I’ve decided that it’s also ok to just check in here when I can, wherever I’ve got something to share, without feeling the pressure to make it a business. 91 Magazine has very much become my main focus business-wise, so I feel happy to let Patchwork Harmony be here, quietly in the background. Always there when I’ve got something to share, like an old friend who doesn’t mind that you haven’t called for a while, and who accepts you however much you’ve changed over the years. The blog has changed too over the years, I guess reflecting me and my life - I feel like it has slowly evolved into more of a personal lifestyle blog rather than solely interiors. I will of course continue to share our own renovations and home projects, but the topics I am feeling the urge to write about here are more focused around general life as well as my passion for creative and independent business. I see this blog more as a platform to share my thoughts on things I feel strongly about rather than trying to ‘make a living as a blogger’. I wrote a post last year reflecting on ten years in blogging and how the industry has changed, which I think is what has led me to change my perspective on my blog. So, looking ahead to 2019, I am going to simply go with it. If I write here - great - if I don’t, I’m not going to beat myself up about it. There’s only so much one woman can do, but I do hope to pop in here now and again with posts that will hopefully be inspirational and/or thought-provoking. I’ve written these ‘year in pics’ posts for as long as I can remember, not minding if no-one gives a stuff about my year, but because it is simply something I enjoy doing for me. I love to look back and recall the things I’ve done with my family, or the achievements I’ve made in my career - it is a mini celebration of what has passed over the last 12 months. Yes, not every day or month has been rosy, but rather than dwell on the bad, these posts give me the chance to reflect on the good things, and feel gratitude for life’s journey, which otherwise can seem to hurtle by in a heart beat. Even if you aren’t a blogger, I really recommend you take some time to look back on your year and maybe jot down a few of the lovely things that you’ve done. I find Instagram and the photos on your phone are good places to refer to when reminding yourself of events. Here’s how my 2018 looked…. lapping up the Mexico City vibes! The year kicked off in a super busy fashion - I was either at home - working, decorating or planning our kitchen renovation - or I was travelling. Actually, I fitted in quite a bit of travelling in the first three months of the year! We decided to make a bit of an effort as a family to take more day trips, so we visited Margate in January and Lewes in February - both towns I love for their independent vibe. At the end of February I popped to Bordeaux with my friend and 91 colleague Jemma to shoot a home tour for the magazine. Then at the start of March, I got an amazing opportunity to travel to Mexico City as a media partner at a design fair there. That was definitely a highlight of my year. If you had’ve told me last Christmas I would go to Mexico in a couple of months, I would never have believed it! It is such a cool city, rich in culture as well as hip and edgy, with loads of great shops, cafes and restaurants to explore. I wrote a guide to the city if you are thinking of visiting. Straight after arriving home from there, we went back to my homeland of Northern Ireland to celebrate my dad’s 70th birthday. And bam! the first quarter of the year was done! The glorious UK summer of 2018! Beach time on the Isle of Wight. April is always a busy month for me as the magazine is published, but once the majority of the work for that was out of the way, we took ourselves off on another little trip! This time, we headed up to Wales, where we’d be invited to stay at this lovely place. I’d never been to Wales before - I really loved it, and got to visit a shop I’ve been wanting to go to for literally years - Baileys Home & Garden - although they have a no photo policy (which I find quite strange in this day and age) so no pics from there. We did discover some other lovely shops - more about them in this post. Back in London, we were basking in a pretty glorious summer, and I fondly remember a lovely day at the Green Rooms Market which I also wrote about here. I remember I took Ruby in her buggy which must have been one of the last times I used it, as it now seems so funny to imagine her riding in a buggy -she is so grown up these days! Writing this, I’m realising how much we got away this year! At the end of May we made our annual trip to the Dordogne to see family, visiting the flea markets plus eating and drinking a lot. I took one of my fave pics of Ruby and her dad here too, it’s still my screensaver on my phone now! Running creative business workshops was a new thing for me this year! the kitchen - finally done! The hot summer continued, and I won’t forget the workshop we ran at The West Collective fair at the start of July - it was SO hot! 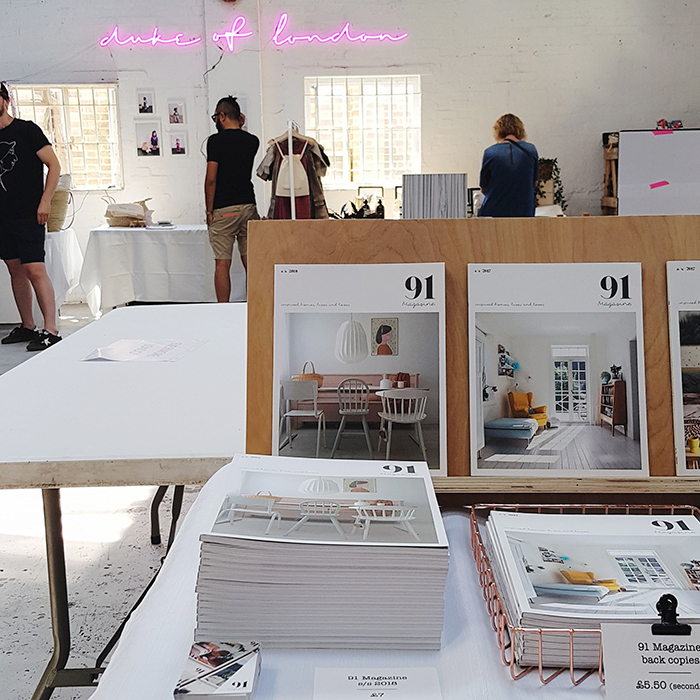 It was a great event- as well as the workshop, we also sold the magazine alongside lots of other lovely indie makers - but England were playing in the World Cup, and it seemed everyone would rather be outside with a cold beer than shopping inside! After all the travelling we did earlier in the year, we stayed put for most of the summer months, finishing off the kitchen makeover and getting other bits done in the house, like tiling the hallway. Ruby turned four in the summer, we had celebrations and days out with her, enjoying the amazing weather and making the most of our time before she started school in September. We adjusted to a new schedule of school runs and her having her own little life which felt like quite a big step in the world of parenting. I rounded off the summer with another workshop for creative business owners while frantically trying to get the next issue of the magazine ready to go to print! As autumn rolled in, it seemed the travel bug reappeared! We had a child-free weekend away in Somerset for my birthday, visiting Bruton for an afternoon and then staying in Frome for a night and going to the Frome Independent Market on the Sunday. I can’t recommend this highly enough, especially if you are a fan of independent shops and brands, I loved it so much! For Ruby’s first half term holiday we whisked her away for her first city break. We went Oslo, which, wow - it was cold! We stayed in a ‘too-good-to-be-true’ Airbnb, and spent our days cafe-hopping to warm up in between exploring the city. I really enjoyed it, although it probably wasn’t my favourite ever city. I can’t quite put my finger on why, perhaps because we went to Copenhagen the year before, which I LOVED. In November, I ran another workshop with my colleague Jemma. This was our first longer session, where we added in some practical exercises for attendees, and it was such a great day. I’m hoping we will fit a few more of these in this year! We did a speedy day trip over to Paris to shoot of a shop for the upcoming issue of 91, and I popped down to Lewes to hatch plans for our first creative day event! It’s been a great year developing the magazine and the 91 brand - adding the workshops and events. I’ve got a few other ideas brewing for 2019, so I’m excited to get cracking on those too! The year ended with a quiet Christmas at home with a chance to recuperate from a busy few months and take stock on the past year and plan for the next. I hope to catch up with you again here soon! Let’s see where 2019 takes us! You can follow me on Instagram for more regular posts both at @patchworkhrmy and @91magazine.